Could Life for Horse Players Get Any Easier? …that was not enough. After revamping the Oldest System on the Planet and adding video tutorials and bonuses, even though I am very proud of the outcome…(Like I said earlier, other so-called winning systems sell as high as $200.00 a pop and don’t offer near as much information as the Oldest System does at a low $47 price), I just couldn’t help but feel like I needed to take the system leaps and bounds past the competition. But…I Wanted To Make The Oldest System Stand Out WAY Above The Competition? Fact is, there are 3 learning styles that everyone adheres to. If you think about it, it’s so simple, but easily overlooked. Learn by Reading – Some people pick up on things simply by reading a book. The Oldest System has that covered with 50 pages of reading material and graphic visuals that teach you my system’s ins and outs. Learn by Watching – Even more people would rather watch a video and learn as opposed to reading and with the addition of my video tutorials, you can do just that! Literally watch over my shoulder as I take you through the entire process. Have Someone “Do It For You” – Maybe you don’t even care how I get my selections and you would rather I just give you the selections!…YOU GOT IT. 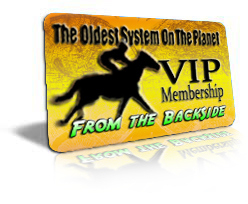 OSOP’s From the BackSide is my exclusive VIP membership service where I provide you with every qualifying OSOP selection, every day at every North American race track. Sounds like a chore, right? Believe me- it is! I sift through dozens of racing forms, looking for the Oldest System on the Planet horses and post them on OSOP’s From the BackSide. I also report the results every day and show you how the horses did and what they paid. Because I want to serve you better, this membership service also keeps up with all of our statistics, providing members with insight into both “hot” and “cold” tracks and how well OSOP is performing in exotic bets, like exactas, daily doubles, pick 3′s, pick 4′s, etc. These are just a few of the services OSOP’s From the BackSide provides and I’m always looking to improve on it. I want to make From the BackSide the premier horse racing selection service all based around the Oldest System on the Planet and I feel that’s what we have ACCOMPLISHED! OSOP’s From the BackSide will not only save you the time and hassle of drudging through racing forms and squinting at small print to find the OSOP jewels hidden in past performances, it will also save you the money spent on these racing forms! Why buy another form when I can give you the OSOP horses on a daily basis! Believe me, this is a selection service you don’t want to miss! Whatever your learning style, the Oldest System on the Planet can work for you. PLEASE NOTE: You will be billed $29/month until cancelled. To cancel, simply send us an email at info@horseplayerhaven.com. It’s that easy.